← reclaimed tin is in place! So I started. I knew that I had to start right away. Downsizing, ugh. Where to start?! Luckily, I am not a pack rat. I am a very organized person with self-diagnosed OCD who periodically goes through everything and gets rid of stuff we don’t “need”. But we STILL have a lot of stuff. Hubby and I were junior high school sweethearts who went our separate ways in high school and reunited after our divorces at age 40. So we merged two households worth of stuff when we moved in together. Two living room sets, two dining room sets, MANY bedroom sets, two brand new grills and four flat screen TVs. And most of our stuff was nice and relatively new, so we kept it. We live in a 2600 sq ft, 4 bedroom/2 bath house on a half acre, so it all fits. Also, I am an artist. 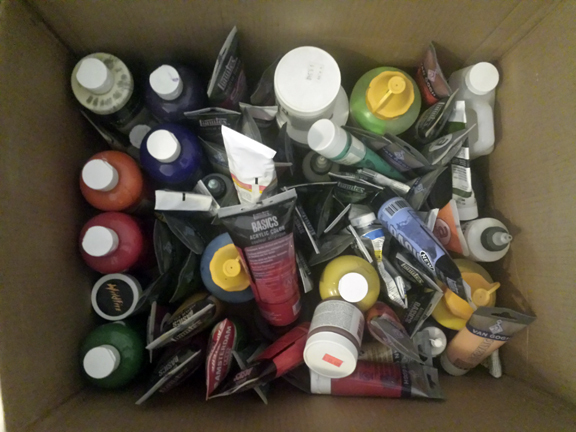 I have a studio full of art supplies. Not just my supplies, my children’s too. It has always been so nice to have this space for my children and me to create art. Other kids are jealous of my kids because they have access to pretty much any art supply they can dream up. We don’t have to run out to Michael’s because everything Michael’s has is already in my studio. 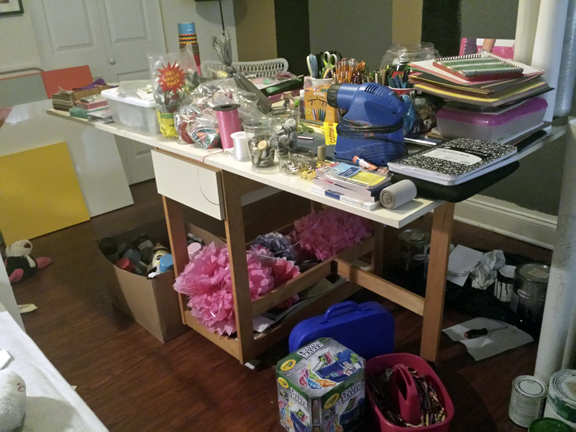 My craft table with all the craft and art supplies that have to GO! But it ALL has to go. I will eventually have a studio again, but not for a few years. There are lots of priorities that come ahead of a studio, like say, a well, or solar panels, a second tiny house because my oldest daughter is almost a teenager and will need her own space, important stuff for living. Of course, I think we all need a little art in our lives to be happy, but we will have to get that fix outside of our home for awhile. The studio will come after all of the necessities. So in the meantime, it’s gotta’ go! And then there’s all the PR I have received as an artist. How do I get rid of that? The Coastal Living magazine issue that I was featured in from 2004, my Flair magazine article with the large photographs of me when I was still chubby from childbirth and had super short platinum hair, all of the newspaper articles, the gallery opening invitations, particularly the solo shows that have my name typed out in huge letters. Do I get rid of it, or put it in storage? Will my daughters be mad at me years down the road for getting rid of it all? Will they be that interested in their mother’s history? I have scanned a lot of it. Is that sufficient for our memories? And then there’s my children’s old school and artwork, arggghh! Thank goodness all of my pictures are digital and saved on a separate server. That’s one thing I don’t have to worry about! Speaking of loving your family’s history, what about all of the photo albums that I have from my grandmother’s travels around the world? Let’s add that she was my idol. I named my daughter after her. How can I get rid of that? And how about all of the old family photographs? Do I keep them and put them in storage? I don’t want to keep a storage unit forever, just until our homestead is all built out, so whatever we keep will eventually have to find a home with us on our property. Weatherproof storage shed, maybe? Oh, my head hurts. I have this horrible habit of picking at my lip when I am stressed (a habit that I had successfully kicked recently), but I just discovered myself doing it again. So I decided to dive right in. 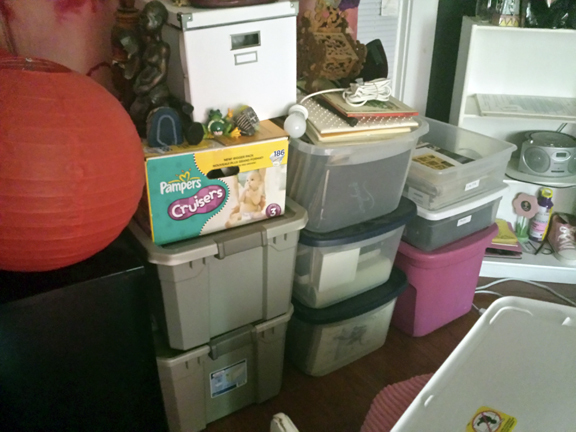 First, I cleaned out my studio and organized all of the things that we are going to donate to our favorite craft store, The Upcycle Trading Company, in St. Petersburg. They have this $25 fill a bag sale that is awesome. Someone will use our stuff, and that makes me feel better. Gotta’ love upcycling!! Then I moved my oldest daughter into the old studio. The bedroom set she was using is a large metal antique set that belonged to my grandmother. It has two twin beds with head and footboards, a nightstand, a tall dresser and a cute little dressing table with a round mirror and a bench. There are even mod metal lamps to match. It was always my intention to have an automotive body shop strip the set down to the metal (there are two layers of paint on it, at least) and put a gloss coat on it. 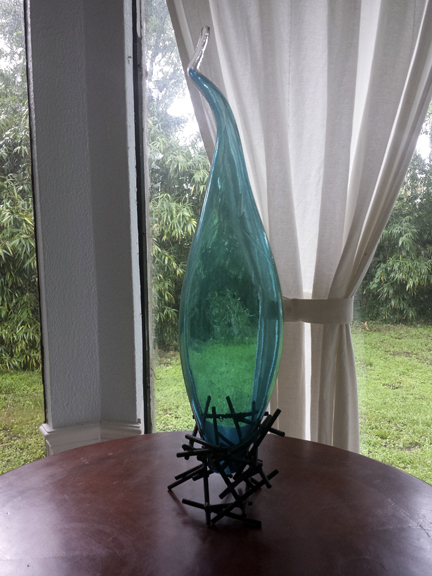 It would really look fantastic in an industrial/mid-century modern sort of way. But I never did because of the expense. Now she has an IKEA bookshelf, one twin bed, a chair and a desk in her room. Very minimalist. She loves it. She told me how great she feels now that she has gone through all of her belongings and has only kept what she loves (even though she complained that she had to do it). Now I am using her old bedroom as my staging room to sell things off. We hope to use the money we make from selling our stuff to buy things we need on our homestead, like the solar panels. I have started putting everything in that room and organizing it into where it will be going…old clothes, baby things, toys, etc. will go to a worthy donation place. 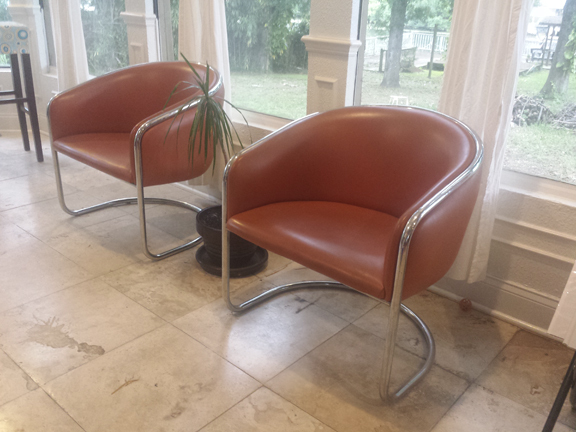 I plan to contact some mid-century modern furniture stores around the Tampa Bay area to see if they are interested in my collection of furniture. 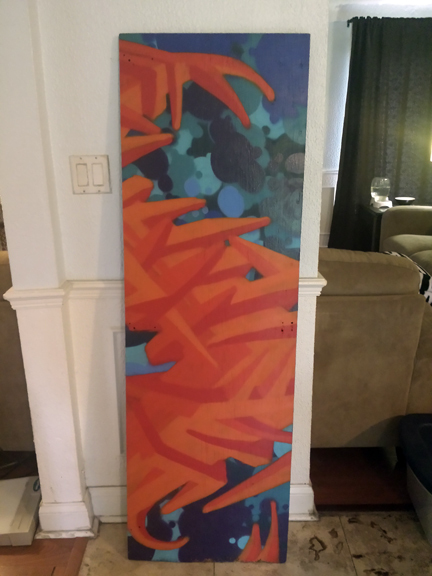 I want it to go to a good home, to someone who will appreciate it! Then the rest, like our stove, refrigerator, washer and dryer, will go on Craigslist. However, despite my anguish at losing these things, I know how relieved I am going to be when it’s all gone. It will set us free. Stuff only weighs us down. We spend our lives paying for stuff, and then paying for a house big enough to put our stuff. And we don’t use most of it anyway. It’s crazy. We choose not to do that anymore. One thing that I realized in this cleansing process is just how much garbage we humans create. Wow. I mean, think about all the households there are in the world, and how much furniture they go through in a lifetime…and where it all goes when it is worn out and thrown away. Think about all the construction debris in the world. It is shocking to me that we haven’t already filled the whole world up with garbage. The scale of it is massive. It’s horrifying to me. My goal is to have it all gone to new homes by next Spring. Can I do it? The Bumbleshack is a tiny house, art studio and aspiring organic farm in the mountains of western North Carolina. In 2014, my family left the mainstream world behind to create a simple life in our tiny house called The Bumbleshack. This blog is all about our journey. update on the land prep! the bumbleshack is soon to be the bumbleshack FARM! how much money are we saving by living tiny exactly?? what happened to the bumbleshack crew?!?!? !